I just love a good stir-fry. They are so easy to make and can be put together a million and one ways. They’re an excellent way to use up those random vegetables in your fridge that you’re just not sure what to do with before they start going bad. A lot of times I will use frozen veggies, especially during the winter. I typically use broccoli, peas, a bell pepper, carrots, onions, and cauliflower. The night I made this I only had broccoli, peas and a bell pepper on hand so that’s what I made and it was incredibly delicious. 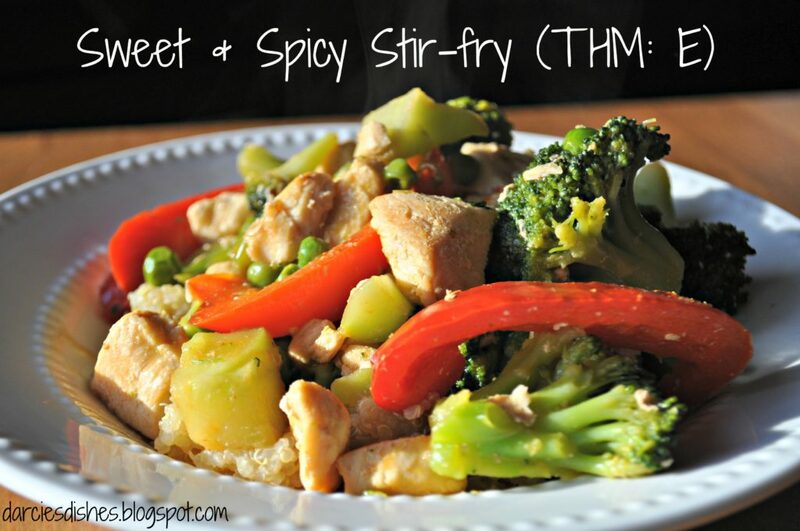 If you don’t have stir-fry on your regular meal rotation you have got to start adding them in! It’s one of my family’s favorite meals. Stir-fry is such a versatile meal. You can literally use whatever veggies and protein you have on hand. It is such a great way to help clean out the refrigerator and freezer. For nights that are really busy, or you get home late, stir-fry is a perfect choice. You can put this whole meal together in about 30 minutes. No need to grab takeout! My family prefers it served over brown rice or quinoa. My kids usually prefer brown rice, but quinoa is so much more nutritious. Just a note if you decide to make quinoa, please make sure you rinse it really really well. If you do not rinse your quinoa it will have a very bitter taste. You do not want to ruin your whole meal with bitter quinoa. The sauce for this dish can be a little spicy for some people. You can very easily reduce the amount of Sriracha or Frank’s Red Hot sauce to make it suitable to your spice level. If you absolutely do not like anything spicy, my basic stir-fry sauce may be a better fit for you. For those of you that follow Trim Healthy Mama, this is an E dish. To make this Sweet & Spicy Stir-fry start by bringing the water (or chicken broth) to boil in a small saucepot for the rice or quinoa. Remember that if you are using quinoa you need to rinse it before cooking. Cook to package directions. Meanwhile, in a large skillet, melt the coconut oil over medium heat. Add the chicken and cook until the meat is cooked through about 8-10 minutes. If you’re using frozen vegetables, place them in a strainer and run them under hot water for about 2 minutes. If you’re using fresh vegetable get them chopped and ready. In a small bowl or measuring cup combine all the ingredients for the sauce and set aside. You may want to taste the sauce before adding it to the pan to make sure it is spicy enough for your liking. Add the veggies to the skillet. Cook, stirring frequently for 3 minutes. Pour in the sauce and cook until the veggies are just tender, about 8-10 minutes. Serve over 1/2-3/4 c. quinoa or brown rice. In a small saucepan, bring to boil the water (or chicken broth) to boil for the rice or quinoa. Cook to package directions. In a large skillet, melt the coconut oil over medium heat. Add the chicken and cook until the meat is cooked through. If you're using frozen vegetables, place them in a strainer and run them under hot water for about 2 minutes.In a small bowl combine all the ingredients for the sauce and set aside. Add the veggies to the skillet. Cook, stirring frequently for 3 minutes. Add the sauce and cook until the veggies are just tender, about 8-10 minutes. ***This amount of hot sauce will give you a nice medium spice; if you'd like mild use 3/4 t. hot sauce. If you'd like it really spicy, the use 1 1/2 T. hot sauce. 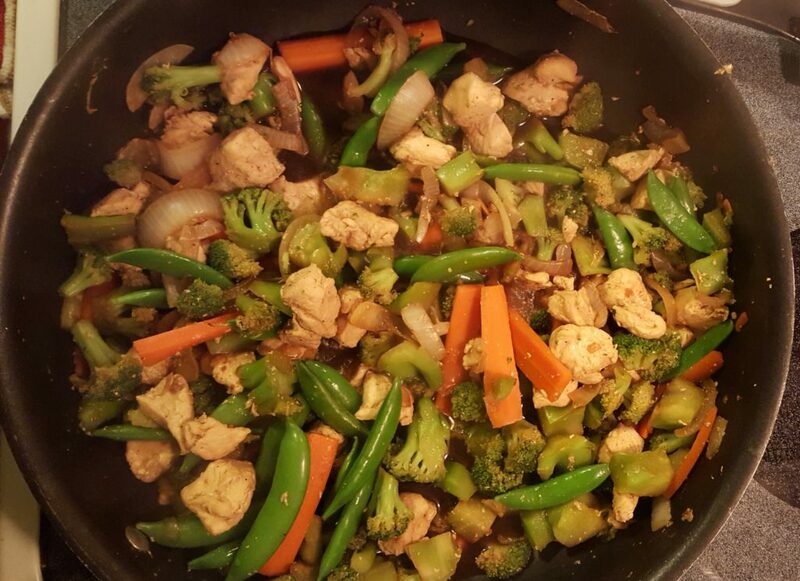 I made this tonight with leftover veggies from a vegetable tray…big thumbs up from me and my hubby. Delicious and easy! Yes, you could try green beans.